Fringe, my love! What a great closing season finale. We find out almost immediately that Astrid is fine. (Of course my Astrid is fine. She had to be okay. After all, she was in Letters of Transit!) Belly has taken Walter captive, where he proudly shows a horrified Walter the new world he’s created. (Oddly enough, Bell’s perfect world has room for only one human: himself. He is perfectly content with the human race dying out, and letting his hybrid animals live peacefully by themselves.) Bell claims to have gotten the idea from Walter. Walter did indeed being thinking of working on an entirely new universe, but the idea so scared him–that is, his own brilliance–that he begged Bell to take out parts of his brain. Nina comes to the realization that Bell’s power source is Olivia; with all the cortexiphan in her body, she is the one triggering the collapse of both universes. With this information, they manage to triangulate Bell’s location: on a boat (no swim trunks and flippy floppies on this one, unfortunately). As the two universes are collapsing, the ship Bell and Walter are on can has already disappeared into the other universe, meaning only Peter can see it. Luckily for them, Olivia has the power to cross between universes. They jump from their helicopter into the parallel universe–and onto the boat–where they storm the cabin where Bell and Walter are. Bell has been reciting Yeats, and Walter manages to stealthily load Bell’s gun. Peter points his gun, stolen from the helicopter at Bell, who happily announces that it’s too late–even shooting Bell will not stop it. Then Walter turns, says, “Forgive me,” and shoots Olivia point-blank, effectively cutting off Bell’s power supply–and the collapse of both universes. Craziness! Bell rings his bell and vanishes to who-knows-where. Peter is distraught, but Walter brusquely tells him to help lift Olivia to the table. Apparently there’s so much cortexiphan in her system that if they get the bullet out, her brain will be able to heal itself. They perform the “operation” successfully, and our Olivia’s okay again! (Ignoring everything I know thanks to Letters of Transit), my mind is officially blown. Again. 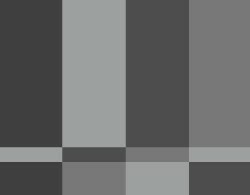 This episode has been on my mind for a few days, and I’ve come to the realization that it was a good episode–especially part two–and I have to accept it the way it is. I still wish the episode 19, Letters of Transit, didn’t give so much away, but it was still a pleasure to watch. Although some of the answers seemed too tidy, I’m guessing that it’s either because it will be addressed next season, or they were having a hard time transitioning to a maybe-season-five when originally writing this episode. I don’t really understand Olivia’s powers; they seem to come and go at will. Why couldn’t she have prevented September from being shot? And the fact that she now might not have cortexiphan in her system seemed too… intentional. My way of thinking usually goes: if I could have thought of the scenario (for example, of a spike of cortexiphan to have Olivia “die,” then save her, and then her “death” use up all the extra cortexiphan), then I’m not impressed. I was also unimpressed with Peter’s ability to get September out of his magical rune with a little rubbing of a 2 by 4. Also, why didn’t they call back-up? Or were they just ahead of the other FBI agents…by like 30 minutes? I find it interesting that Observers cannot see their own futures. Or September can’t, anyway. How would one go through their future memories? If Walter was so unemotional when shooting Olivia, why couldn’t he do the same to Bell? Was he out of bullets? Surely he didn’t want to let Bell get away–after all, Bell was going to destroy two universes. I didn’t like the “cliche-ness” of Olivia being pregnant. Plus, it’s like 4 years too early if the child is Henrietta. But maybe these questions/quibbles will all be answered next season. Now we know where Etta’s bullet-necklace came from! Bell: The Bible tells us God created his universe in seven days. It’s taken me considerably longer. Beautiful. Isn’t it? Olivia: Well, what are we gonna do about finding Walter? Our only lead is dead. Peter: That doesn’t mean we can’t still question her. Bell: Yes, Walter. We cut those ideas out of your head to literally put ‘the Genie’ back into the bottle. Then I grew older. I grew cynical. I grew cancer. Then I realized that dosing myself with Cortexiphan would slow it down. But slowing is not stopping. For me, it’s just a matter of time. The clock is ticking. Tick, tick, tick, tick. And that’s when it occurred to me. You were right, Walter. Walter, you were right, right, right. Every rant you ever went on made perfect sense. Suddenly, I understood not just you – but everything. God made us in his image. If that is so, if we are capable of being Gods, then it is our destiny to do so. Bell: My dear friend, even if you deny it now, you have always been playing God. I am. PETER: It’s gonna be okay. OLIVIA: You know, for the first time, I don’t think that it is. I remember being in that lab in Jacksonville when Walter and William were doing the Cortexiphan Trials. I remember how it smelled, how I felt, how scared I was, how all alone I was. And now, you know, years later, nothing’s changed. I’m still that little girl, and William Bell is still doing experiments on me. I’m just still being used. PETER: No. Something has changed. This time, you’re not alone. Walter: I’m so sorry, Olive. Walter: Excuse me, Miss. Is that Lemon Jell-o? Orderly: These are urine samples. Walter: Oh, well, in that case, no, thank you. I’m more peckish than thirsty. Walter: I don’t suppose you’re here for a sandwich. September: We have to warn the others. They are coming. “The Two B’s,” as they affectionately call themselves! 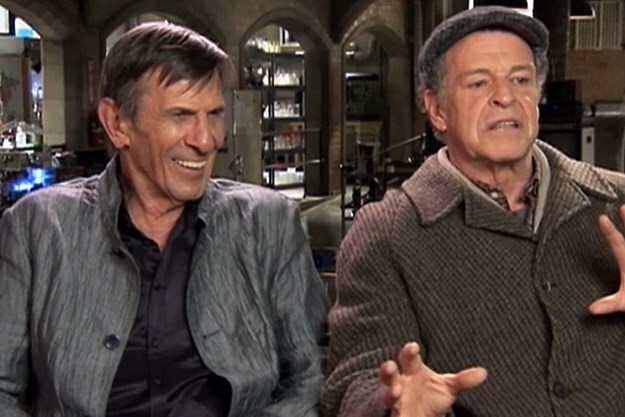 See more behind-the-scenes with Leonard Nimoy and John Noble here and here. I was baffled too as to why he didn’t shoot bell.